The storm is now underway and starting to organize. The purple in central Oklahoma is freezing rain (glaze ice) with temperatures in the upper 20s. That will cause road and highway conditions to deteriorate rapidly. Farther north and west, the blue shades are snow with darker blue = heavier rates of snowfall. However, none of the snow is heavy at this point. 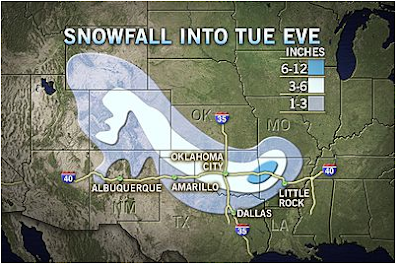 That said, the snow should accumulate about as expected over the High Plains. Gray = dense fog advisory which affects Atlanta Hartsfield and Nashville airports. Orange is a blizzard warning and light green is a blizzard watch in a part of the country that rarely sees blizzards. It will cripple travel. The deep purple along the West Virginia-Virgina border is an ice storm warning which will also cripple travel and may cause power problems. 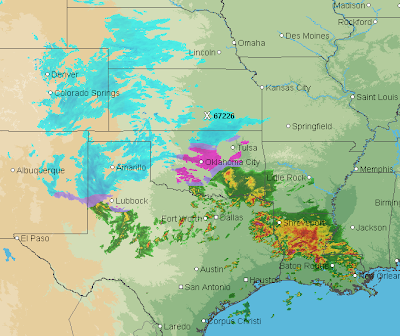 Pink is a winter storm warning that now extends into the Red River counties of northern Texas -- again a part of the country that rarely sees winter storms which will cause serious travel problems. The winter storm warning extends all the way to Cleveland and northwest Pennsylvania. Snowfalls will likely exceed a foot with higher drifts in places. I would also extend the winter weather advisory one row of counties farther north near the Mississippi River later today. We have a severe thunderstorm watch until 9am for thunderstorms that will produce damaging winds and hail up to around 1" in diameter. 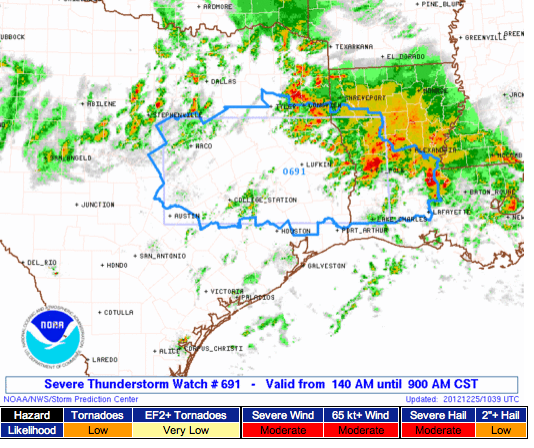 The severe thunderstorm watch is setting the stage for even worse conditions. 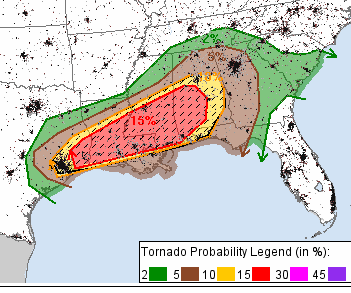 Here is the tornado probability map from 6am today until 6am tomorrow (Wednesday). Keeping in mind that 5% is the significant threat threshold, these numbers are very high for this time of year. Some of the tornadoes will occur at night. The hatching is where tornadoes greater than F-2 intensity may occur. This includes Birmingham, Montgomery, Jackson, New Orleans, Baton Rouge, Lake Charles and Houston. I cannot emphasize strongly enough that if you are in the 5% or higher area you should keep up with the latest storm warnings today and tonight. 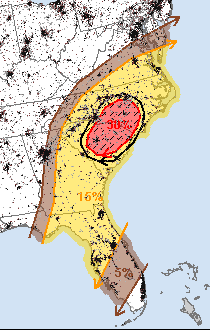 There is also a significant threat in the Carolinas tomorrow. Like so many, I'm looking forward to being with family today, attending Mass, etc. So, I cannot "live blog" this storm. My plan is to update every few hours to the extent possible. I urge those in the tornado risk area to keep up with local weather warnings. AccuWeather is also providing coverage here. Merry Christmas Mike! Thanks for giving everyone a heads up on a situation that's looking more dangerous by the minute. (It appears there has already been confirmed tornado damage in Texas as of 9:30 CST).